Challenges 2014: The Great European Renaissance or Depression, who will lead the EU from 2014? A farewell to ODA? Look who's talking? The future of Pacific-EU relations: with or without the ACP? Anna Knoll and Niels Keijzer (DIE) based this article on a shorter blog version: “Can we afford to ignore migration post-2015?”, ECDPM Talking Points, 27 July 2012. EEAS review and development: Yet another EU coordination challenge? Brecht Lein and Nicola Tissi wrote this briefing note in the context of a joint research project by the European Centre for Development Policy Management (ECDPM) and the German Development Institute / Deutsches Institut für Entwicklungspolitik (DIE), 2013. Klaus Rudischhauser on EU development aid: Where to and what for? Mali donors’ conference: Towards low cost solutions? Anna Knoll, Florian Kratke, Niels Keijzer and Jorrit Oppewal contributed to this paper. Completed in December 2012 and updated in May 2013. James Mackie and Anna Knoll did an interview with the Deutsche Welle, 23 April 2013. GREAT insights - What prospects for a new development framework post-2015? Geert Laporte made a presentation on "Challenges and opportunities for newer EU Member States to contribute to the implementation of post-2015 agenda, especially by sharing transition experience". Watch a recording here. James Mackie attended this event and gave a presentation. Andrew Sherriff, Geert Laporte and Anna Knoll participated in this meeting. James Mackie sat on the panel on 'Status of debate on the interactions between migration and development'. Geert Laporte participated in this workshop. Geert Laporte, Andrew Sherriff, James Mackie and Florian Krätke participated in this event. Andrew Sherriff, James Mackie, Jeske van Seters and Florian Krätke attended this event (side event European Development Days 2013). Several ECDPM staff members attended this event. Geert Laporte attended this meeting. Andrew Sherriff will moderate one of the sessions and Florian Krätke will also attend this event. Jean Bossuyt and Willem Vervaeke facilitated this seminar. Presentation of results of European Think Tanks Group conference ‘Looking beyond 2013: Are Africa-Europe relations still fit for purpose? Faten Aggad presented the conference results to the sub-committee. Geert Laporte and Faten Aggad presented the conclusions of the ETTG High-Level Conference ' Looking Beyond 2013: Are EU-Africa Relations Still Fit for Purpose?' at the JTF plenary session. Jan Vanheukelom sat on the panel and gave a presentation. Geert Laporte made a presentation on Pacific, ACP and EU relations at this meeting. 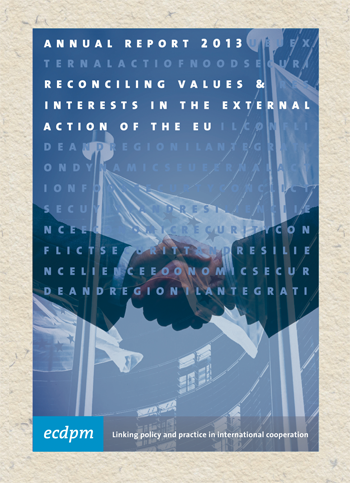 What is the role of culture in EU external relations? Damien Helly attended this meeting. James Mackie presented a paper at this meeting. Jean Bossuyt and Anna Knoll made a presentation and facilitated the EU Council’s Working Party on Development Cooperation’s informal discussions on the post-2015 development agenda. James Mackie presented the ERD 2013 report at an internal meeting with the French government. Florian Kratke attended this event. Geert Laporte, Sahra El Fassi and Emily Barker attended this meeting. Andrew Sherriff and Anna Knoll attended this conference to present ECDPM and our work on Policy Coherence for Development and Migration. Andrew Sherriff and Greta Galeazzi gave a presentation at this roundtable discussion. James Mackie facilitated this meeting. Jean Bossuyt and Willem Vervaeke facilitated this meeting. Paul Engel and Quentin de Roquefeuil attended this meeting. The meeting brought together a small set of experts in order to comment on a draft methodology ECDPM and the OECD are designing in order to assess the impact of OECD non-aid policies on food security in developing countries. Paul Engel, Andrew Sherriff and Melissa Julian attended this conference. During this event, Quentin de Roquefeuil attended the Committee meeting on Economic Development, Finance and Trade on 15 June and the meeting on EPAs on 17 June. San Bilal moderated the workshop on Business on 16 June for the Irish Presidency and attended the meetings on 17 June. Paul Engel made a presentation and Anna Knoll attended this event (in Dutch). Florian Krätke gave a presentation at this workshop. Paul Engel and Greta Galeazzi attended this meeting and presented ECDPM's Discussion Paper 144 on policy coherence for development. The authors of the ERD 2013 - including ECDPM's James Mackie - presented some of the findings of the report at this event. The ERD was presented at a public launch event. Brecht Lein presented ECDPM's Discussion Paper 144 "Insights from Developments in National Policy Coherence for Development Systems" at this event. Geert Laporte attended this event. Geert Laporte and Brecht Lein discussed findings from a joint research project with the German Development Institute on perceptions of ACP-EU cooperation. Geert Laporte made a presentation at this briefing seminar. ECDPM's Paul Engel presented the ERD's key findings. Melissa Julian participated in this meeting. Geert Laporte made a presentation. Florian Krätke gave a presentation. Francesco Rampa and Greta Galeazzi presented the ECDPM study on policy coherence for development at this seminar. Anna Knoll attended this meeting. Geert Laporte gave a presentation. Damien Helly attended this background briefing. Paul Engel was one of the discussants. ECDPM's Jan Vanheukelom and Anna Knoll presented the ERD's key findings. Alfonso Medinilla attended this policy planning seminar. Andrew Sheriff spoke at this seminar. Paul Engel attended this meeting. Geert Laporte attended the senior official meetings and gave a presentation. Discussions covered the Post -10th EDF multiannual financial framework; How to increase the Impact of the EU’s Development Policy; and MDGs: Post 2015 prospects. Florian Krätke attended the meetings on 15 and 16 April. Paul Engel was a presenter and moderator at this public seminar, and Andrew Sherriff, Brecht Lein and Florian Krätke give presentations. James Mackie attended this meeting in his capacity as team leader of the ERD 2013. Camilla Rocca attended this event. James Mackie attended this meeting in his capacity as team leader of the ERD 2013. There was a live stream of this event. The 2014-2020 EU Aid Budget: Enough to do the job? Florian Krätke attended this workshop. Andrew Sherriff participated in this meeting which reflected on the report ‘Dutch Development Cooperation: Ahead of the Crowd or Falling Behind?’ The report compares the Dutch situation to the role of other European countries in international cooperation. Paul Engel spoke at the seminar. Paul Engel participated in this meeting and distributed ECDPM’s Discussion Paper on this issue. Geert Laporte participated in this dialogue. How to revitalise Africa-EU relations in the run-up to the 2014 EU-Africa Summit? Geert Laporte has addressed this public seminar. Geert Laporte made a presentation on the current situation of EU-African Union cooperation. Andrew Sherriff attended this event which discussed the European Parliament’s recommendation to the EU High Representative. On the 2013 EEAS review. Paul Engel and Jeske van Seters attended this informal, information sharing meeting. Florian Krätke was one of the speakers at this seminar.